8. 12. 18 - WRWS/NRHA - - Gunnatrashya – NRHA’s Newest Two Million Dollar Sire. Thanks to the success of his offspring at the 2018 National Reining Horse Association (NRHA) Futurity, we are excited to announce that Gunnatrashya is NRHA’s newest Two Million Dollar Sire. Owned by Arcese Quarter Horses USA, Gunnatrashya is by NRHA Hall of Fame Inductee and Ten Million Dollar Sire Gunner and out of Natrasha. The 2006 sorrel stallion had just as successful of a career in the show pen as he has had in the breeding shed. 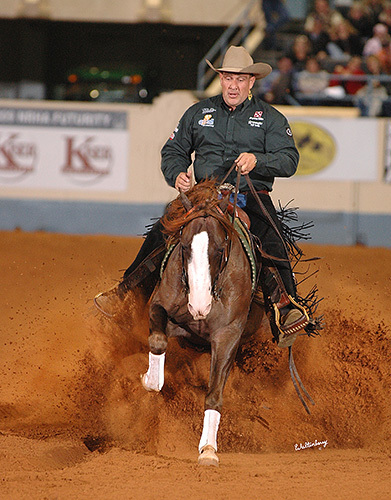 With NRHA Six Million Dollar Rider and Hall of Fame Inductee Shawn Flarida at the reins, Gunnatrashya was the 2009 All American Quarter Horse Congress Open Futurity Champion, 2009 NRHA Open Futurity Champion, and 2010 NRHA Open Derby Champion. Even with limited showing, he has NRHA Lifetime Earnings (LTE) of over $218,000. With NRHA Six Million Dollar Rider and Hall of Fame Inductee Shawn Flarida (© Cam Essick)Gunnatrashya had 65 offspring entered in the 2018 NRHA Futurity (Open and Non Pro), and together they earned just under $300,000 at the event, giving him a lifetime total of $2,166,218.70 in offspring earnings. One of the most notable offspring was Gunna Stop, owned by Alexandria Gokey, who won more than $66,429 alone under Austin Lee Roush. Gunna Stop was both Level (L) 1 and L2 Champion, placed 5th in L3, and was a L4 finalist at the Futurity. Additionally, KR Ima Trashya, owned by Leslie Martin, earned over $20,392 and Gunnarickashay, owned by Jody and Jolan Puno, won more than $14,994. Gunnatrashya currently stands at Oswood Stallion Station. 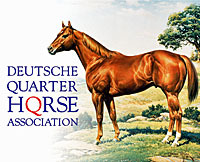 Congratulations to Gunnatrashya and Arcese Quarter Horses USA on this outstanding achievement! 6. 12. 18 - WRWS/AQHA - - AQHA Implements International Care Team. 6. 12. 18 - WRWS - PARTNER PFERD 2019: Vieles neu macht der Januar. Vollblüter, sanfte Riesen, edle Rosse: Vom 17. bis 20. Januar 2019 finden sie alle einmal mehr ihr Zuhause auf der Leipziger Messe. Präsentiert von der Sparkasse Leipzig und der Sparkassen-Finanzgruppe Sachsen wird die nunmehr 22. PARTNER PFERD erneut zum Podium und Treffpunkt der internationalen Spitzen-Pferdesportwelt. Besucher können sich auf die weltweit besten Springreiter, Voltigierer und Gespannfahrer freuen sowie auf zahlreiche Neuerungen gespannt sein – und diese beginnen bereits direkt am Eingang. Die Besten der Besten: Leipzig als Dreifach-Weltcup-Station. „Auch 2019 wird das Fünf-Sterne-Turnier in Leipzig zum spektakulären und hochrangigen Showdown für die spannende Weltcup-Saison 2018/2019. Die Besucher der PARTNER PFERD können sich auf vier Tage voller packender Prüfungen und Shows freuen“, macht Turnierchef Volker Wulff Lust auf die bevorstehende Veranstaltung. Erneut laufen die weltbesten Springreiter, Gespannfahrer und Voltigierer auf und hoffen traditionell auf die einzigartige Unterstützung des Leipziger Publikums und die unvergleichliche Stimmung in den Messehallen. Zu den sportlichen Highlights zählen die Qualifikationen und Prüfungen im Longines FEI Jumping World Cup, im FEI Driving World Cup und im FEI Vaulting World Cup. Expo 2019: Mehr Raum für Investitionsgüter. Rund 260 Aussteller aus dem In- und Ausland bieten in der Expo alles, was das Herz von Reiter und Pferd begehrt, zum Kauf an. Besucher können sich auf einen Mix aus beliebten Alt- sowie attraktiven Neuausstellern freuen. „Besonders spannend wird der Expo-Bereich in der neu eingebundenen Glashalle“, verrät Projektdirektorin Peggy Schönbeck. „Die schon jetzt nachgefragten Ausstellungsflächen unter den 25.000 Quadratmetern Glas sind vorrangig Unternehmen der Investitionsgüterbranche vorbehalten.“ Produkte wie beispielsweise Stall- und Führanlagen, Kutschen, landwirtschaftliche Geräte sowie Pferdetransporter werden hier vor der imposanten Kulisse der Glashalle präsentiert. Erweiterte Ausstellungsfläche: Neues Forum und große Kinder-Erlebniswelt. 2019 stehen „Huf“ und „Bewegungsapparat“ im Fokus. Ebenfalls neu gesattelt wird die Kinder-Erlebniswelt erstmals in der Glashalle. Unter dem Motto „Cowboys und Indianer“ warten zahlreiche Attraktionen und Mitmach-Aktionen in einer liebevoll gestalteten Prärie-Landschaft mit Kutsche, Pferd und Westernfiguren auf die Nachwuchsreiter. Vom Ponyreiten über das Schürfen eines Goldschatzes bis hin zu lustigen Cowboyspielen – hier werden die Träume der jüngsten Pferdefans wahr. Sanfte Riesen im Aktionsring 2019. 5. 12. 18 - WRWS/NRHA - NRHA Four Million Dollar Rider: Craig Schmersal. 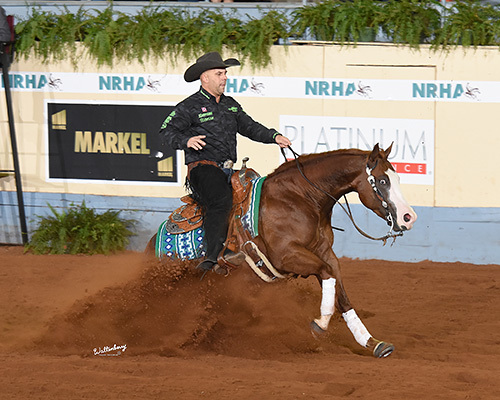 The National Reining Horse Association (NRHA) sends congratulations to its newest NRHA Four Million Dollar Rider: Craig Schmersal. Schmersal qualified three horses for the NRHA Open Futurity Finals this past weekend – Ladysdreamofblueeyes, The Star Jersey, and Pale Quistador – to reach the next level in his career. 3. 12. 18 - A Smoking Run leads to the 2018 NRHA Open Futurity Champion. 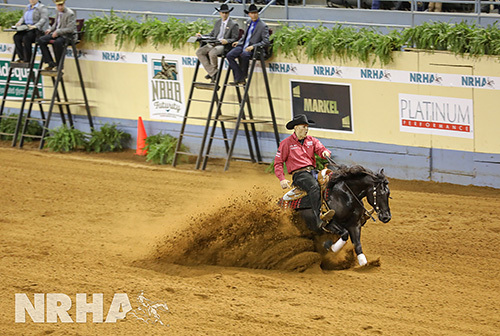 The 2018 National Reining Horse Association (NRHA) Open Futurity Finals featured a field 70 horses deep across the four levels and prime time division. At the end of the night after the last score had been announced, NRHA Million Dollar Rider Jason Vanlandingham, riding A Vintage Smoke for owner Diane Mesmer, secured the title of 2018 NRHA Open Level (L) 4 Futurity Champion [video]. A Vintage Smoke, nominated by Karl Hapcic, is by NRHA Million Dollar Sire A Sparkling Vintage and out of Lady Smoke Peppy. “I had been struggling with some things this week. I thought my turns went as good as they could be. In the warm up pen, he was really locked in and gave me a ton of confidence,” said Vanlandingham. He went on to add, “I went for it all and ran him through the gate as hard as we could run, and he swallowed that first stop up.” A Vintage Smoke earned $142,500 for his owner and $7,500 for his nominator. Isnt She Perfect and rider Kole Price took home the L4 Open Reserve Championship. Isnt She Perfect is by NRHA Two Million Dollar Sire Walla Walla Whiz and out of Miss Silver Gun. She is owned by Amy Meadows and nominated by Tamarack Ranch LLC. The owner’s and nominator's share of the purse was $130,352 and $6,518, respectively. Winning the L3 Open division, Prime Time Open, and Prime Time Open Reserve Championship was NRHA Million Dollar Rider Mike McEntire aboard two similar named horses. 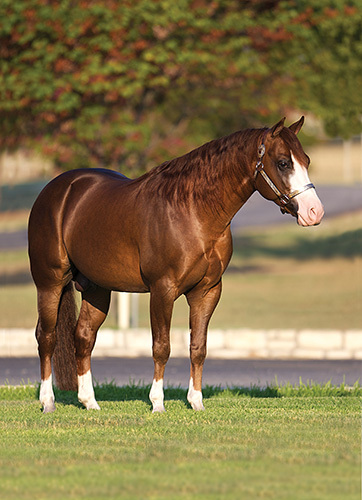 McEntire rode his first draw, Pale Faced Whiz (NRHA Million Dollar Sire Pale Face Dunnit x Ms Maggie Whiz), for owners A4L-Equine to a score of 218 ½ to win the title of Prime Time Open Reserve Champion and a top ten finish in the L3 Open division. Pale Faced Whiz is nominated by Ginger Schmersal. McEntire’s second draw, Pale Face Whiz, slid to a score of 222 ½ earning the duo the title of Open L3 Champion and Open Prime Time Champion, as well as more than $87,000 in owner and nominator earnings [video]. The sorrel stallion is by Pale Face Dunnit and out of Lady Naskiia Whiz. He is nominated by Everett Wiggins and owned by Everett and Karen Wiggins. “It felt good; the horse has been so good all week. He has stayed real solid,” said McEntire when asked about his run on Pale Face Whiz. Earning the L3 Open Reserve Championship was Vintage Jewels and NRHA Million Dollar Rider Dell Hendricks. Vintage Jewels, owned by Kristi Clark, is by A Sparkling Vintage and out of Jewels Lil Sparkle and nominated by Todd Vernon. Riding to the L2 and L1 Open Futurity Championship was Austin Lee Roush and Gunna Stop (NRHA Two Million Dollar Sire Gunnatrashya x Stop Little Sister) owned by Alexandria Gokey and nominated by Toyon Ranch LLC [video]. “I felt pretty confident. Both of my horses rode good for the whole horse show. I was ready to show today,” said Roush when asked about his run. Tying for the L2 Open Reserve Champion was Smokin Paleface (Pale Face Dunnit x Lost In Tinseltown) with Brent Naylor, and Mr Royal Hollywood (NRHA Million Dollar Sire Hollywoodstinseltown x Cee Miss Hollywood) with NRHA Million Dollar Rider Cody Sapergia. Smokin Paleface is owned and nominated by Tim Anderson. Mr Royal Hollywood is owned by George and Carol Bell and nominated by George Bell. Tinker This and Thiago Sobral earned the L1 Open Reserve Championship for owners Mary Beth and Tim Ruckman. Tinker This is by Tinker With Guns and out of Tejons Finally Dunit and nominated by Silver Spurs Equine. The 2018 NRHA Open Futurity witnessed the second largest purse in the event’s history with nearly $1.5 million awarded Saturday night. Additionally, there was an 8% increase in horses entered (399) and 14% increase in total entries (1,124).